Italian rockers Markonee finds inspiration in a single source classic melodic hard rock, with most of from the 1980's. It Winger, Warrant, Ratt or more modern European interpretations like Gotthard get your heart beating, than Italy's Markonee and their second release, See The Thunder, is just for you. Their version of classic rock can sound a little heavier, on the metal side, at times like on Shores of Another Sea or The Big K. But, generally, it's all solid melodic rock with impressive vocal arrangements and big, catchy arena rock hooks. Unfortunately, it takes a short time to get started as the opener Way 2 Go and the following Women are rather unimpressive. But it gets better as songs like Back On Me and Brand New Day sneak up and snag you with their clever melodic hooks. The album ends like it begins on two rather conventional and mildly interesting numbers, Cherry Blossom and I in Father Christmas. For pure classic melodic hard rock, Markonee's See The Thunder is a strong effort. 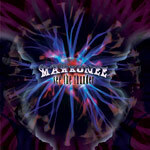 For pure classic melodic hard rock, Markonee's See The Thunder is a strong effort in the field.